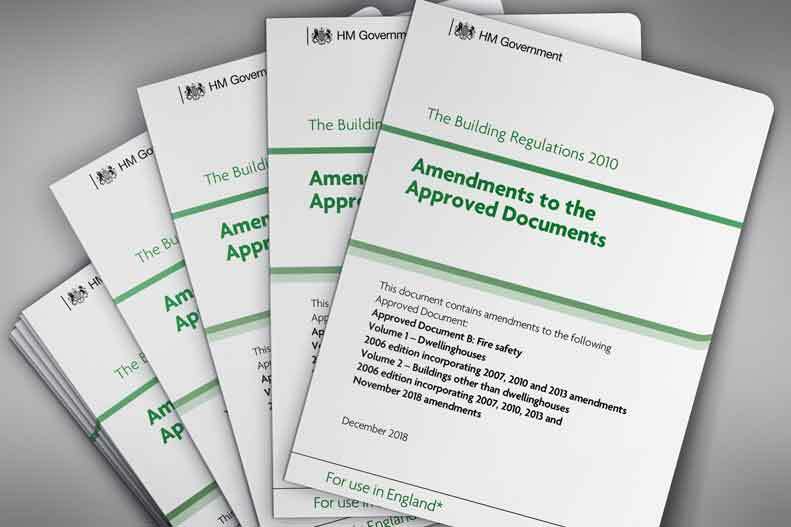 December 2018 saw the publication of amendments to the Building Regulations in England, as part of the response to the Grenfell Tower disaster. The amendments came into effect in January 2019. Which areas of the Building Regulations have been changed? Part B of the Building Regulations, supported by the guidance published in the two volumes of Approved Document B, is the natural starting point for looking at what has been altered. Two amendment documents have been published and are available via the government website. The first covers both volumes of Approved Document B and consists largely of some new introductory text for the two volumes, re-numbering of paragraphs affected by the amendments, and some changes to the appendices. The second document covers volume 2 of Approved Document B only (buildings other than dwellinghouses), and comprises a revised wording of requirement B4 (external fire spread), together with replacement text for the whole of section 12 (construction of external walls). There are also some changes to other appendices. The revision to requirement B4 and section 12 of volume 2 goes so far as to also include the text of the amended regulation 7 of the Building Regulations. Regulation 7 deals with materials and workmanship, previously consisted of one paragraph only, and is supported by its own Approved Document. The decision to reproduce the text in the amendment to Approved Document B volume 2 arguably reflects the extent to which many construction professionals are unaware of the full extent of the Building Regulations and how they should be approached holistically. Further paragraphs have been added to regulation 7 to make law the requirement to use materials of limited combustibility for the “external wall, or specified attachment, of a relevant building”. Paragraph 4 of regulation defines a ‘relevant building’. As a manufacturer of extruded polystyrene insulation, Polyfoam XPS has received enquiries relating to the Building Regulations amendments, and the rest of this post explains our understanding of how the use of Polyfoam XPS products should not be affected by the published amendments. Where a flat roof meets an external wall, an upstand is required to help prevent the ingress of water to the building. To limit the cold bridging effect of the junction, the upstand should also be insulated, and Polyfoam XPS offers Upstand Board specifically for this application. Some people have interpreted the upstand as forming part of the external wall. Where an upstand is on a ‘relevant building’ as defined by the revised regulation 7, their concern is that XPS insulation – which does not achieve a Euroclass A1 or A2 fire rating – is no longer appropriate. However, paragraph 3 of the revised regulation 7 lists exceptions where the new requirement for materials of limited combustibility does not apply, including “any part of a roof if that part is connected to an external wall”. The roof upstand constitutes part of the flat roof and it is therefore our view that a Building Control Body should continue to accept the use of a product like Polyfoam Upstand Board on projects that fall under the description of a ‘relevant building’ in paragraph 2 of regulation 7. The revised regulation includes not only external walls, but also ‘specified attachments’. A number of items are considered to be ‘specified attachments’, including “a balcony attached to an external wall”. This has led to concerns that where a flat roof designed as a balcony abuts an external wall, the materials in the flat roof should meet the requirement for limited combustibility. Inverted warm roof constructions featuring Polyfoam XPS products are frequently designed as balconies. However, in these situations, if the balcony is insulated then that means it is over a heated space. It therefore becomes a thermal element in its own right – i.e. a flat roof – and is subject to all other necessary Building Regulations requirements – including fire safety. Our view is that a balcony considered to be a ‘specified attachment’ is something essentially bolted on to the external wall, outside of the thermal envelope and considered on its own merit in terms of fire performance. Should you or your Building Control Body have any questions or concerns about the use of Polyfoam XPS products on projects where this sensitive area of regulation applies, contact our technical helpline on 01429 855120, or email technical@polyfoamxps.co.uk. Next PostNext IS PRICE STILL THE DRIVING FACTOR ON CONSTRUCTION PROJECTS?